CONCORD, N.C. – Running his fastest lap in the final round of Thursday’s knockout qualifying session at Charlotte Motor Speedway, Kyle Busch earned the top starting spot for Sunday’s Coca-Cola 600, NASCAR’s longest race (6 p.m. Sunday on FOX, PRN and SiriusXM NASCAR Radio). 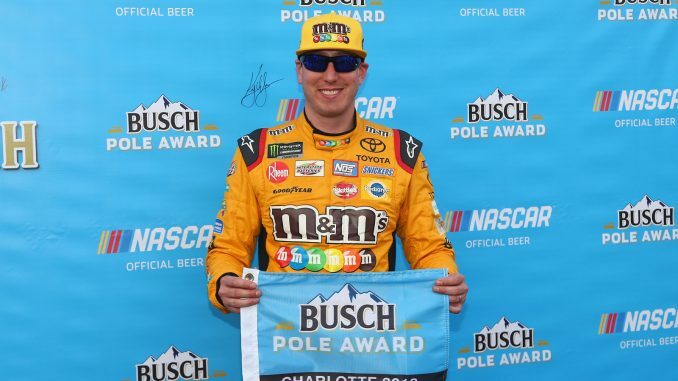 Streaking around the 1.5-mile oval in 28.149 seconds (191.836 mph), Busch claimed his third Busch Pole Award of the year, his third at Charlotte and the 30th of his career. Already a three-time winner this season, Busch will have the additional advantage of first pit stall selection for the 13th Monster Energy NASCAR Cup Series event of the season. Busch’s No. 18 Joe Gibbs Racing Toyota was .091 seconds faster that the No. 22 team Penske Ford of Joey Logano (191.218 mph). Denny Hamlin, Busch’s JGR teammate, qualified third at 191.049 mph. 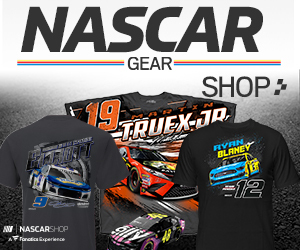 Charlotte is the only active Cup track where Busch has not recorded a victory in a points race, though he has 11 top fives and 16 top 10s in 28 starts. The 2015 series champion’s only win at CMS came in last year’s Monster Energy NASCAR All-Star Race. “It’s important to me, but I’m not sure it’s important in the grand scheme of things,” Busch said of his desire to knock the final track off his checklist. “It’s certainly important to me, and I would love to get that knocked out of the way and to be finished with it until another new track comes up on the circuit. Logano was 19th fastest in opening practice but improved dramatically in qualifying. “We made some good adjustments,” said Logano, who is second in the series standings through 12 races, 12 points behind Busch. “It’s hard for me to say what was the changes and what was the race track. The Xfinity cars ran on the PJ1 (traction compound in the center lane) and definitely activated it and got the grip definitely up there. The No. 4 Stewart-Haas Racing of Kevin Harvick, winner of the last two Cup points events as well as last Saturday’s exhibition Monster Energy NASCAR All-Star Race, failed pre-qualifying inspection three times and will start from the rear in Sunday’s race. In addition, Harvick’s car chief, Robert Smith, was ejected from the race track for the weekend. Harvick also will lose 30 minutes of practice time in Happy Hour on Saturday. Harvick is attempting to win three straight points races for the second time this season, but Logano is just as glad “The Closer” is starting from the rear. “Are we taking bets on how long it takes to him to get up there?” Logano quipped. JGR driver Erik Jones earned the fourth spot on the grid, and with Daniel Suarez qualifying 10th—having eked into the final round by .004 seconds over Ricky Stenhouse Jr.—all four Gibbs drivers will start from top-10 positions. Brad Keselowski qualified fifth, followed by Ryan Newman, Jamie McMurray, Ryan Blaney, Aric Almirola and Suarez. 1. (18) Kyle Busch, Toyota, 191.836 mph. 2. (22) Joey Logano, Ford, 191.218 mph. 3. (11) Denny Hamlin, Toyota, 191.049 mph. 4. (20) Erik Jones, Toyota, 190.894 mph. 5. (2) Brad Keselowski, Ford, 190.557 mph. 6. (31) Ryan Newman, Chevrolet, 190.201 mph. 7. (1) Jamie McMurray, Chevrolet, 189.940 mph. 8. (12) Ryan Blaney, Ford, 189.893 mph. 9. (10) Aric Almirola, Ford, 189.707 mph. 10. (19) Daniel Suarez, Toyota, 189.707 mph. 11. (42) Kyle Larson, Chevrolet, 188.943 mph. 12. (3) Austin Dillon, Chevrolet, 188.075 mph. 13. (17) Ricky Stenhouse Jr., Ford, 188.844 mph. 14. (21) Paul Menard, Ford, 188.805 mph. 15. (78) Martin Truex Jr., Toyota, 188.679 mph. 16. (41) Kurt Busch, Ford, 188.363 mph. 17. (6) Matt Kenseth, Ford, 187.983 mph. 18. (37) Chris Buescher, Chevrolet, 187.905 mph. 19. (38) David Ragan, Ford, 187.526 mph. 20. (13) Ty Dillon, Chevrolet, 187.402 mph. 21. (24) William Byron #, Chevrolet, 187.272 mph. 22. (9) Chase Elliott, Chevrolet, 187.110 mph. 23. (48) Jimmie Johnson, Chevrolet, 186.625 mph. 24. (43) Darrell Wallace Jr. #, Chevrolet, 185.816 mph. 25. (15) Ross Chastain(i), Chevrolet, 187.624 mph. 26. (95) Kasey Kahne, Chevrolet, 187.585 mph. 27. (88) Alex Bowman, Chevrolet, 187.493 mph. 28. (14) Clint Bowyer, Ford, 187.279 mph. 29. (34) Michael McDowell, Ford, 186.890 mph. 30. (47) AJ Allmendinger, Chevrolet, 186.716 mph. 31. (32) Matt DiBenedetto, Ford, 186.047 mph. 32. (96) Parker Kligerman(i), Toyota, 185.103 mph. 33. (72) Corey LaJoie, Chevrolet, 183.150 mph. 34. (23) Gray Gaulding, Toyota, 183.138 mph. 35. (00) Landon Cassill, Chevrolet, 182.970 mph. 36. (66) Timmy Hill(i), Toyota, 180.222 mph. 37. (55) Jeffrey Earnhardt, Chevrolet, 178.974 mph. 38. (51) BJ McLeod(i), Chevrolet, 177.731 mph. 40. (7) JJ Yeley(i), Chevrolet, 0.000 mph.